Mike Greene - mgreene@shawmedia.com Marengo's Allison Rogutich (cq) lauches through the air while competing in the girls triple jump at the Ed Reeves Invitational track meet Saturday, April 14, 2012 in Marengo. Rogutich took first place in both the triple jump and long jump competitions. 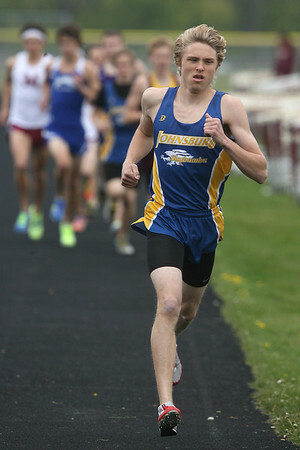 Mike Greene - mgreene@shawmedia.com Johnsburg's Dan Fox takes a commanding lead during the 800m race at the Ed Reeves Invitational track meet Saturday, April 14, 2012 in Marengo. Fox went on to win the race. 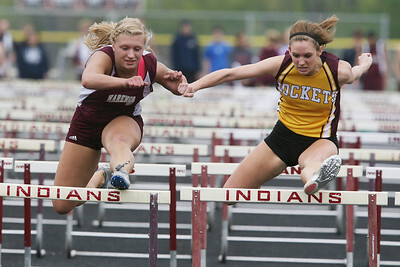 Mike Greene - mgreene@shawmedia.com Marengo's Allison Rogutich (left) and Richmond-Burton's Talia Sheedlo battle during the girls 100m hurdles at the Ed Reeves Invitational track meet Saturday, April 14, 2012 in Marengo. Mike Greene - mgreene@shawmedia.com Marengo's Allie Sprague races ahead of Hampshire's Cassie Kruse during the 800m race at the Ed Reeves Invitational track meet Saturday, April 14, 2012 in Marengo. Sprauge won the race with Kruse taking second place. 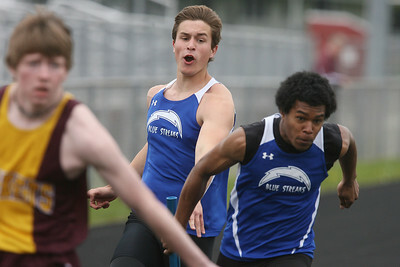 Mike Greene - mgreene@shawmedia.com Woodstock's Nate Hams (center) hands off to teammate Mike Walton during the 4x100m relay at the Ed Reeves Invitational track meet Saturday, April 14, 2012 in Marengo. Woodstock won the event as well first place for the boys overall competition and coed competition. Mike Greene - mgreene@shawmedia.com Marengo's Mike Zaranski bends the bar during the pole vault event at the Ed Reeves Invitational track meet Saturday, April 14, 2012 in Marengo. 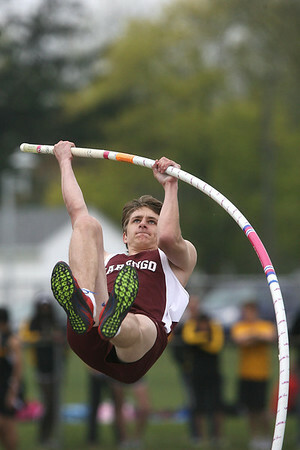 Zaranski topped his personal record, notching a 13' 9'' vault and winning first place in the event. Mike Greene - mgreene@shawmedia.com Woodstock's Maura Beattie leads a pack of racers during the girls 3200m run at the Ed Reeves Invitational track meet Saturday, April 14, 2012 in Marengo. Beattie took first place in the event. 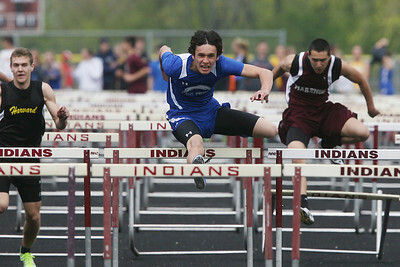 Mike Greene - mgreene@shawmedia.com Woodstock's Tyler Parsons jumps over a hurdle during the boys 110m hurdles at the Ed Reeves Invitational track meet Saturday, April 14, 2012 in Marengo. Parsons took first place in the event and helped Woodstock win the overall points competition for the meet. Mike Greene - mgreene@shawmedia.com Hampshire' Cassie Kruse runs a leg of the girls 4x800m relay at the Ed Reeves Invitational track meet Saturday, April 14, 2012 in Marengo. Kruse helped Hampshire win first place for the event. Marengo's Allie Sprague races ahead of Hampshire's Cassie Kruse during the 800m race at the Ed Reeves Invitational track meet Saturday, April 14, 2012 in Marengo. Sprauge won the race with Kruse taking second place.